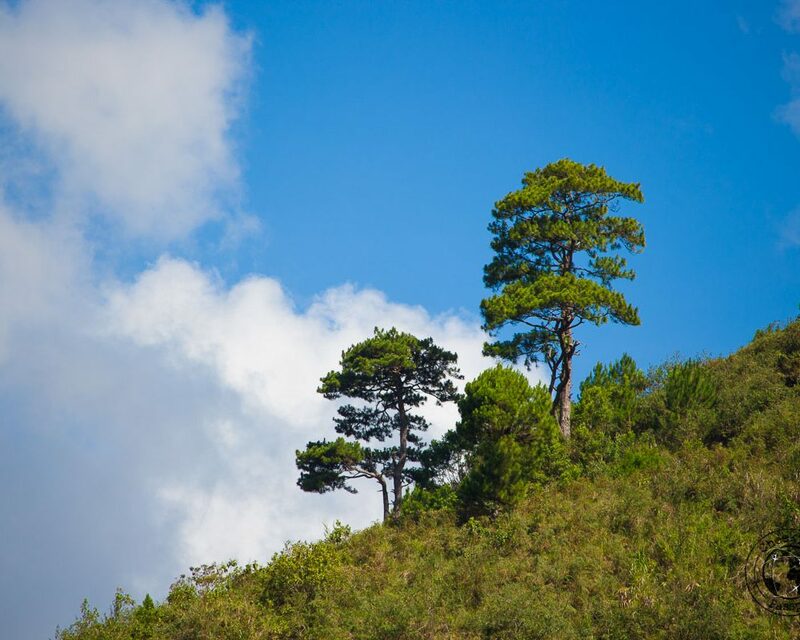 This is a post dedicated solely to the logistics of getting from Bontoc to Buscalan and from Buscalan to Bontoc. Since we found it so difficult to find the relevant details about how to go to Buscalan when we were planning to visit Whang-Od, here is detailed information about this, which we hope will make your journey an easier one. 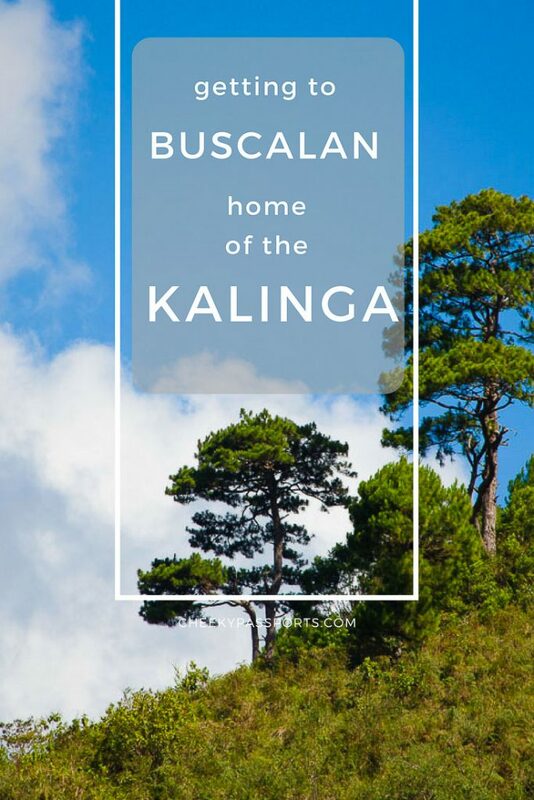 You can read our post about meeting the Kalinga tribe in Buscalan here. 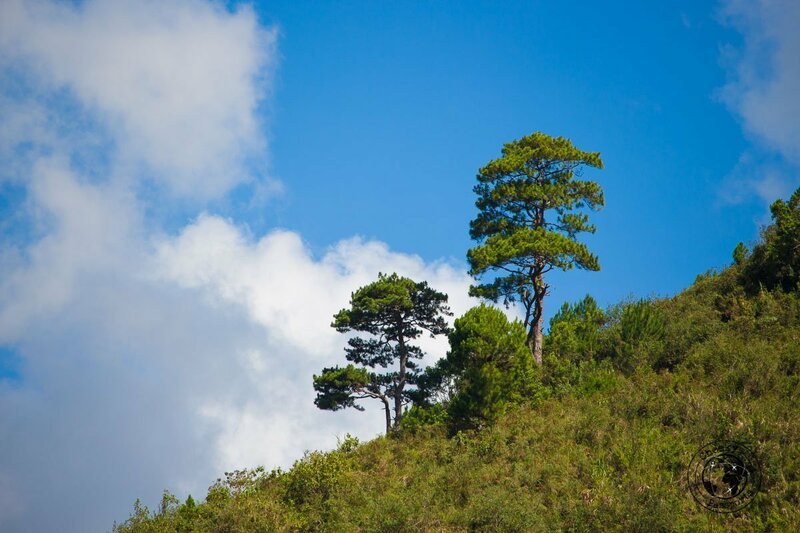 The closest major city to Buscalan, with best connections to Manila is the city of Bontoc. This is where you can get a jeepney that will take you to Bugnay, a smaller town close neighbouring Buscalan. You can also get a jeepney from Tabuk if you happen to be traveling that way. When you’re looking at how to go to Buscalan, you should be aware that the first step is contacting a local guide who will accompany you to his village. Anyone going to Buscalan must travel there in the care of a guide who charges a standard fee of 1000 PHP (€20)/day. The difficulty with contacting a guide is that there’s no cell phone reception in Buscalan, so the best way of doing this is to send an SMS which will be answered when the guide is collecting other tourists in Bugnay. Sure enough, we got our answer within a few hours and the guide we contacted told us that he would meet us in Bugnay on the day we agreed upon. You may contact us if you would like our guide’s phone number. 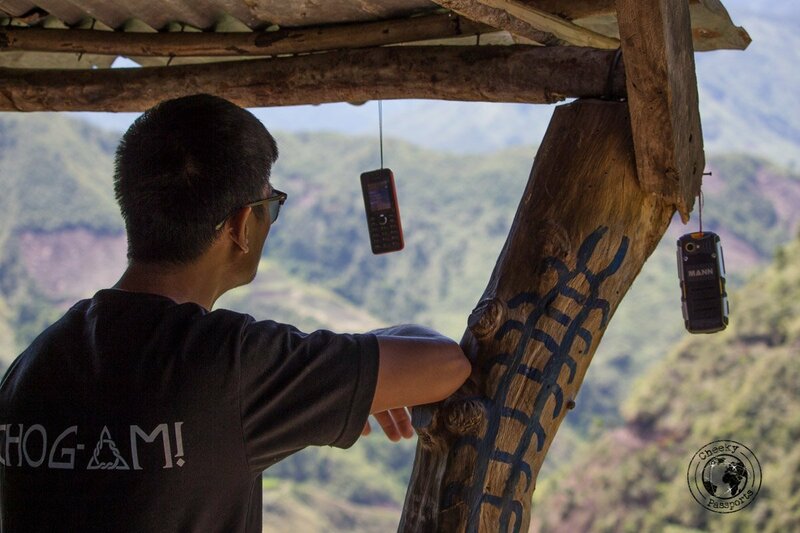 The hanging phones of Buscalan – mobile phone reception is almost non-existent! Funnily enough, nobody in Bontoc could tell us where the jeepney to Bugnay left from. 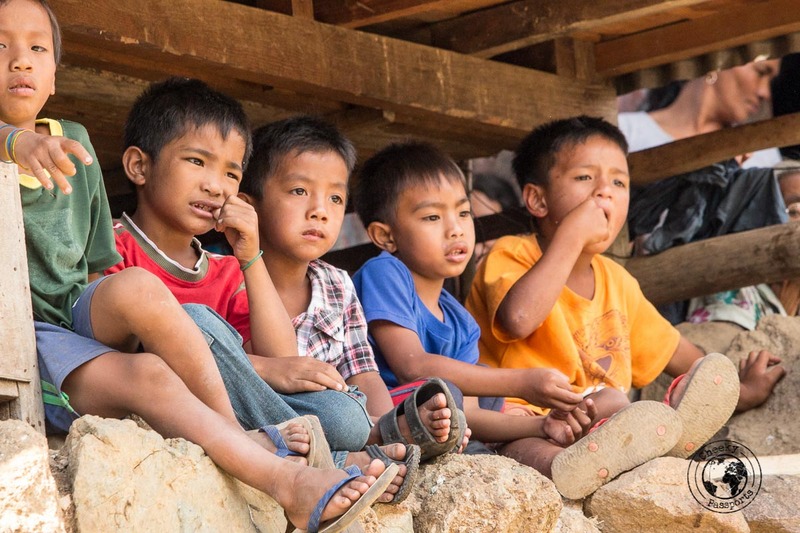 We asked about 10 different people we met on the roads of Bontoc and nobody had an answer, even though they understood that we wanted to go from Bontoc to Buscalan via Bugnay and referred to Whang-Od and the Buscalan Kalinga tribe. Finally, an officer stationed at the tourist police booth gave us proper directions about how to go to Buscalan. As of May 2017, the Jeepney terminal for Bugnay is a few blocks away from the town’s Tourist Police Station, further up the main road leading to Tabuk, on the block of buildings past the polytechnic complex. A jeepney leaves for Bugnay (direction Tabuk) at 7.30am. Be sure to inform the driver that you intend to stop at Bugnay. 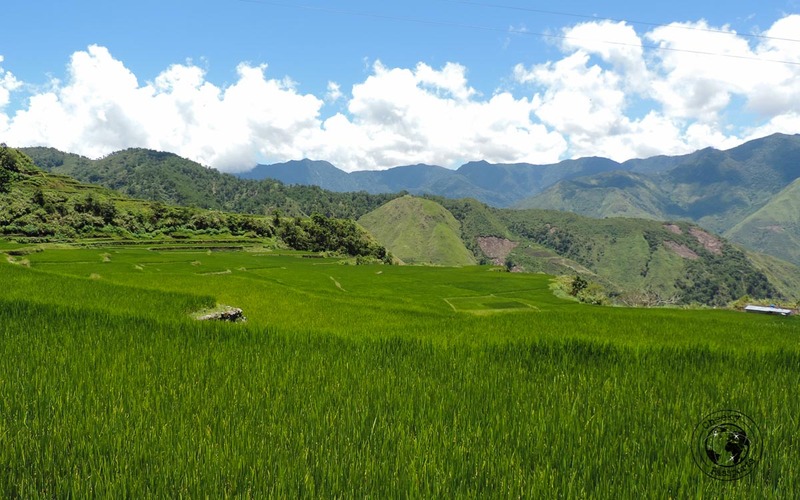 The scenic journey from Bontoc to Bugnay lasted about 2 hours – try to sit on the right side of the jeepney so that you can spend your time looking at the rice terraces rather than mountain walls! Once we alighted the jeepney a group of guys on motorcycles came to greet us. We asked whether they knew Gilbert our guide. They discussed this among themselves for a while and proceeded to inform us that Gilbert had sent them to take us up to the initial point of the trek to Buscalan. Confused as we were, we didn’t really have much of a choice but to get on their bikes and allow them to take us up. It was a 15-minute bike ride up to where the pot-holed “road” ended. BE SURE to carry only a small light backpack with you. I very stupidly carried my laptop in my backpack because I didn’t want to leave it in Bontoc, but almost fell off the bike at one point and had that happened, I wouldn’t be using it to write the post this right now! Nikki was a bit luckier. His weight helped control the speed of the motorbike, and his ride was far more pleasant! Be sure to carry a flashlight in your backpack since power outages are frequent. Once we arrived to the road’s end, we again asked for Gilbert and were told to wait. After a few minutes a guy came up to us and introduced himself as Raffi, Gilbert’s brother. In fact, we wouldn’t see Gilbert at all for the entire time we spent in Buscalan and Raffi would be responsible for us instead. Actually, we were quite horrified to learn that Gilbert was busy with many different groups of tourists since Buscalan was packed with visitors that weekend. Not only did that sound claustrophobic, but it lessened my chances of getting a tattoo done by Whang-Od who was sure to be very busy. 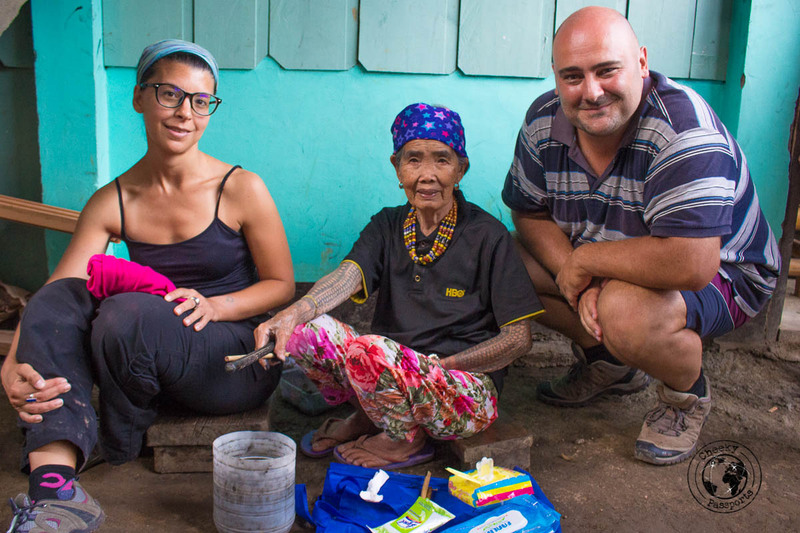 Before we left Buscalan, Raffi told us that between 200-400 people had visited the Buscalan Kalinga tribe that weekend (nobody seemed to know how many exactly). Raffi handed us two wooden sticks in preparation for the trek. We politely refused, saying that we’re not used to walking sticks, yet he insisted and assured us that they would come in handy. As we took a look at the steep narrow mountain path, it became very evident that he was right. The trek to Buscalan wasn’t easy at all. The very steep mountain path was slippery and narrow, and missing a footing meant falling down the side of a high mountain. Raffi was incredibly helpful though, and even offered to carry our backpacks when he saw that we needed frequent breaks from climbing. Again, I silently chided myself for having brought my heavy laptop along. Right there as I slipped and stumbled along the path and held to the mountainside for dear life, it seemed like the worst idea ever (it was). Do carry enough water though, the path is tiring, and you will sweat profusely in the scorching sun. Also be sure to wear appropriate trekking shoes on your journey from Bontoc to Buscalan! The trek up to Buscalan Kalinga village is really slippery! When we finally made it to Buscalan, drained, sweaty and out of breath, we realised exactly how incredibly beautiful our surroundings were. We had completely missed seeing that due to the strenuous activity and attention we were giving to the slippery path! On the day we were set to leave, Raffi collected us from our homestay at around 7am, handed us our walking sticks (which we thought we had lost but turns out that he had safely hid them away somewhere) and we set off on the trek. It was mostly downhill this time and it was a lot easier than coming up. As soon as we finished walking we found a jeepney going directly to Bontoc from the same point where we had been escorted by bike which was pretty convenient! The journey to Bontoc took about 2 hours, most of which we spent checking all the notifications and messages on our phones after having had no connectivity for the previous three days! I stumbled upon your blog and have to say it is very informative ! I have googled for a long time how to get to Buscalan and Whang Od however until now the answers are all very misterious. I was wondering which airport is closest to travel too from the uk? Hi Amy, I’m glad that you found our post helpful! 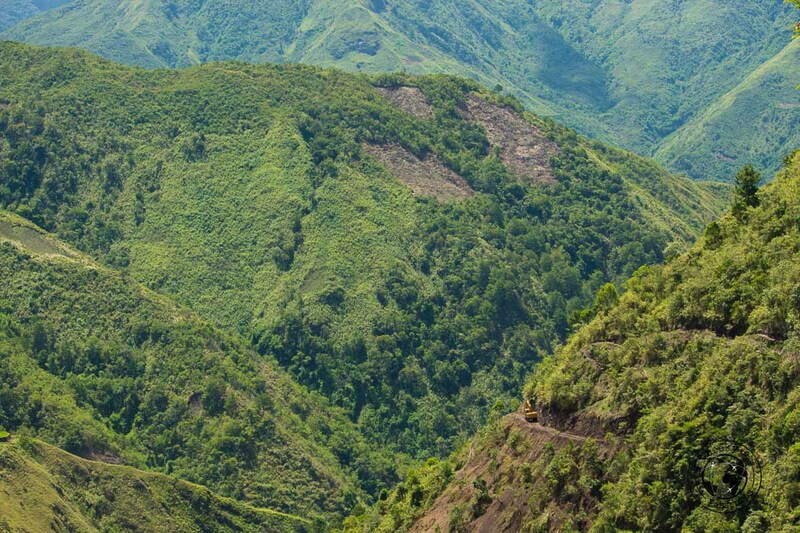 I think that the best way of getting to Buscalan from the UK is to fly to Manila and make your way up from there! Hi! Your post is so helpful! May I ask if you have any idea what time the last trip departs from Bontoc to Buscalan? Hi Suntia! So glad that you found our post helpful! I’m afraid that we don’t know the schedule for the last van from Bontoc to Buscalan – we got the first one just to be sure of getting there, but I doubt that there are more than one or two a day plying the route!